If you thought the ZX Spectrum was “old”, you’ve got another thing coming. Meet the Magnavox Odyssey2, known in Europe as the Philips Videopac G7000. ((in Brazil, it was the Phillips Odyssey, without the “2“; I remember ads for in in the Brazilian Disney comics commonly available in Portugal when I was a kid, in the late 70s and early 80s)). Released in 1978, and competing with the Atari 2600, the Videopac (sorry, Americans, but I grew up with the Videopac name) was a moderately successful console. I think my father bought his in 1980, though there’s no way to be sure; as you can guess, I was quite young back then. Anyway, the console would be used for years, mostly by me and my brother, even after we “evolved” to the 48K ZX Spectrum. It was an interesting system. Extremely limited in terms of hardware ((for instance, its RAM was 64 bytes. That’s right, bytes. Not kilobytes. Yes, it was just used for game states / variables, as the games themselves were on the cartridges ROM, but still…)), it had one unique feature that separated it from other consoles: a (membrane) keyboard. Mostly, it ended being used to select levels and game modes, but it did enable a few word-based games, and later on a few more complex games even came with keyboard overlays in the box. It was too little, too late, though: by then (1981), the system was already quite dated, and couldn’t compete with consoles such as the Colecovision in the US. In Europe, on the other hand, people preferred computers such as the C64, the ZX Spectrum, the Amstrad CPC, and later on the Atari ST and the Amiga (interestingly, it wouldn’t be until the Playstation that Europeans started playing more on consoles than on computers). 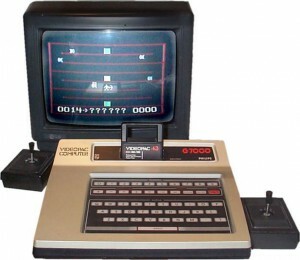 Most Videopac games came on cartriges with memory ranging from 2 to 8KB of ROM (with a couple of them reaching 12KB). No, these numbers aren’t typos. 🙂 Some cartridges even included two or three very different games in the same cartridge. Much like the Atari 2600 (though that one had a couple of exceptions), most games at the time were single-screen affairs, and a lot of them got around the limited memory through the concept of variations (again, something usually not seen these days), by making a lot of parameters be customizable by the user. Because it was just a question of turning bits on and off, a game could have 20 or 30 “variations” without taking up any more memory. Because the console came with two joypads, a large percentage of games were designed for two players (and, indeed, a lot of them required two players, having no AI option), either competing or cooperating. In a way, the Videopac was a more “social” games machine than the later ZX Spectrum, where most games were single-player, more complex, and took much longer to play. This example is interesting for several reasons. For a start, yes, it’s a clone of the Atari 2600 “Outlaw”, from 1979, but it’s also a very different game: you can only aim horizontally, bullets ricochet on the “rocks” (which look like trees), there’s ammo (6 bullets, but you can reload by touching the rock of your color), and if you’re next to a rock you can fire through it (as if you were using it for cover and shooting over it). It also plays faster than the Atari original, and has more room to play. This kind of “pseudo-clones” was typical on the Videopac: yes, the inspiration is clear, but they also took the idea and made it their own. This was also one of the few Videopac games with both 1 and 2-player options: if you didn’t touch a controller for about 10 seconds after starting the game, that player would be controlled by the console (and change color, to show that it wasn’t a human player). And, yes, if nobody touched their controllers, it would play AI vs AI. Now, it wasn’t a great AI, as you can see in the video (both are AIs), but it was still fun — though, of course, there was nothing like playing it against a friend. Also, it was nice how the graphics were extremely simple (they had to be), but the box covers made the games seem so much more than that. Like #11, where I always assumed the red characters chasing us were normal tax collectors, but the box made it pretty clear they were robots. That’s right, in the future they will send robots after you to make you pay your taxes. and then there were #41 and #42, which were so frigging cool they even had larger boxes. And, yes, that’s something I didn’t mention, and should have: almost all the games (at least those published by Magnavox / Phillips, and we didn’t have any one that wasn’t) had excellent, professionally designed and beautiful covers. That didn’t happen with other systems at the time. Even on later systems such as the NES, games typically had terrible covers. Did you know that even today new games are being released on cartridge for this system?? ?